Do We Really Need A 'Balanced' Diet? I used to strongly believe that my meals were not balanced without platefuls of vegetables ~ especially a big pile of dark leafy greens. If necessary, I would add half a bunch or more of parsley to a salad to compensate for any shortage of our daily kale, collards, or bok choy. I especially loved shredded carrot, beet, and chopped parsley salads, or my pressed/squeezed cabbage (and parsley) salads. I enjoyed all that crunchy texture, and imagined my body singing with joy as I consumed all that wonderful fiber, and all those antioxidant-rich vitamins and minerals. During the fall, I really loved roasting up root vegetables. Roasted parsnip chips would melt in your mouth. And of course, I loved eating lots of the really dense, sweet, white, purple, or Japanese sweet potatoes. Those were especially good with a glob of tahini on top. Likewise, our all-time fave, the uber dense, sweet, deep orange kabocha squash ~ heaven on a plate. So what happened? Why do I no longer crave these foods? Isn't it good to 'eat the rainbow?' And of course, you must eat a 'balanced diet!' ~ Right??? I believed vegetables to be Nature's pharmacy. And as per macrobiotic ideology, root vegetables are considered to be especially grounding. Isn't all that beta carotene in the allegedly healthy sweet potato, or those roasted or shredded carrots good for us? Good for our eyes as it converts into Vitamin A in our bodies? Actually, Vitamin A is an important essential nutrient, and many people do not get adequate amounts. Vitamin A is only found in animal foods. Think butterfat. Nice yellow butterfat, like Kerrygold. Despite what many plant-pushing coaches and doctors will tell you, many people are not good at converting beta carotene into Vitamin A. Well, being the (Strong Spirit) Hypercarnivore heretic that I am, I am going to go up against a sacred cow here. I have always seemed to be ahead of the curve ~ like expounding the virtues of eating lots of produce, especially dark greens and vegetables, and eating a vegetarian or vegan diet ~ long before these recommendations were trending. Long before kale was a household word. Pre-internet, ideologies did not spread as fast. By the time recommendations like eating the rainbow, consuming as many greens and vegetables as you can possibly handle each day, and/or giving up animal foods altogether and going vegan were picking up momentum, as they are now, I tended to make my exit. I'm not bragging. In whatever way I have attempted to build a profession as a natural foods chef and author, inspiring how to eat a 'balanced' produce-rich diet as simply as possible ~ my inner rebel part reared its head. Like, well, just as I was completing my FOURTH vegan/macrobiotic and produce-pushing cookbook, and training to become an 'official' macrobiotic counselor, I realized that eating the rainbow was not providing me the glowing health I had anticipated. In fact, I was feeling my vitality decline at a pace that was increasingly alarming. 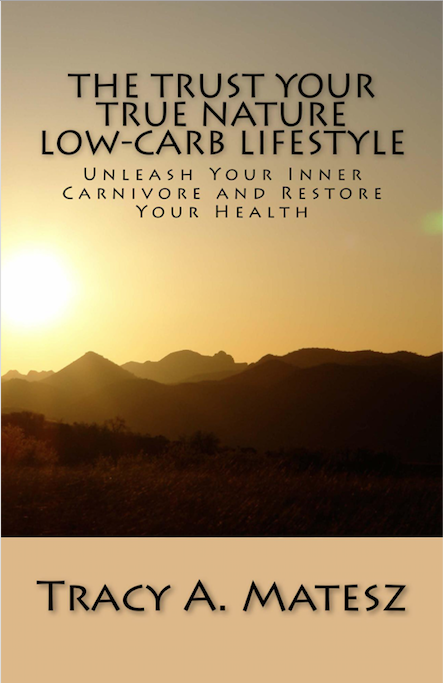 Even though my later books included recommendations for adding fish or other animal products in the diet, it was the results of our initial 30-Day Hypercarnivore Health Challenge, going from high-carb, low-fat, to low-carb, high-protein and fat that caused me to have a full on paradigm shift of my nearly life-long beliefs about diet and health. After listening to and reading blogs and testimonies by others, including Amber O'Hearn of Empirica, who alleviated her long-time depression and improved her ability to lose excess fat by going fully plant-free, Dr. Georgia Ede, of Diagnosis Diet, who has given presentations (including the one below) connecting mental disorders with consumption of plant foods, and many others on meatheals.com who are realizing much needed relief from chronic and often debilitating conditions from eschewing plant foods that I began to question whether those dark leafy green super foods are as super as we are led to believe! These people don't attribute their longevity to downing kale smoothies every day. They eat eggs (found in at least one study to possibly prevent heart disease and cancer), bacon, meats, and food cooked in lard, butter, or beef tallow ~ a.k.a. those allegedly deadly saturated fats. Weston A. Price, D.D.S, author of Nutrition and Physical Degeneration, noted the excellent health of the local native populations from several different continents, all of whom considered animal foods to be the central part of their diet. Those that strayed from their native diet, especially as Western processed foods became more ubiquitously available, quickly showed changes in their bone structure, dental health, and immunity. The contrast was striking. While I am not writing this post to prove that plant foods are unnecessary ~ I've already been proving it to myself via direct experience ~ I am going to suggest that the notion of 'eating a balanced diet' and 'eating the rainbow' are more a product of skilled marketing, then a biological fact with which to build your life, or at least your way of eating around. One thing that people fail to realize is that what the mind thinks ~ and even strongly believes ~ isn't necessarily true, just because you think or believe it! Even if every mainstream media outlet and plant-obsessed nutrition author 'believes' that eating clean, organic, freshly plucked, picked, pressed and juiced greens and vegetables are the epitome of health doesn't make it so. It may sound nice. It may sound right. It may resonate ideologically. However, biology trumps ideology every time! You may not like the idea that humans require animal foods to sustain the level of health we are meant to experience, however, your not liking that does not undo the fact ~ whether you like it or not! Plant foods have their place. Typically, wild plant foods and herbs have been used medicinally for thousands of years. Plants contain a myriad of compounds and volatile oils that are added to broths, or taken as teas, tinctures, and poultices for helping resolve a wide variety of symptoms and conditions. However, kale and broccoli are nouveau foods. They are hybridized versions of their native, wilder cousin. There is no comparison as to the nutrition you get from red meat, relative to bunches of broccoli and kale. Despite what online sites like Cronometer indicate, the vitamins and minerals shown are what is ideally found in those plants, not necessarily what is actually present, nor, more importantly, what is actually being absorbed. Vitamins and minerals in plant foods are less bioavailable. Those seemingly benign colorful plant foods also contain compounds that can be quite damaging to those who are sensitive. Whether that be oxalates, which are especially high in kale, spinach and almonds, and when consumed in excess can lead to arthritic symptoms or kidney stones; phytates, lectins, saponins and more ~ all found in whole grains like quinoa, beans ~ especially soy ~ and other plant foods, that inhibit absorption of minerals and can lead to a host of health issues. Even the plant fibers themselves can be triggering your gastrointestinal discomforts, and causing (or contributing to) constipation! Long-term consumption of these compounds found in dietary carbohydrates can potentially cause leaky gut, and lead to allergies, joint pain including osteoarthritis, and other conditions which have yet to be adequately researched. Plant foods seem to be given a hall pass, while animal foods are vilified. Meanwhile people with joint pain, skin conditions, a host of gastrointestinal problems ~ along with many other chronic concerns ~ are finding relief by giving up the plant foods! Whatever you really enjoy, and that your body actually craves that brings you the greatest health, vitality, and ability to thrive, and live with minimal dis-ease, nor dependency on Western meds. So, if having a delicious coffee with heavy cream, and possibly a small amount of coconut oil, along with bacon and cheese sandwiches provides what you need to help you feel good and focused for the morning, followed by a protein-rich second meal, then have at it. 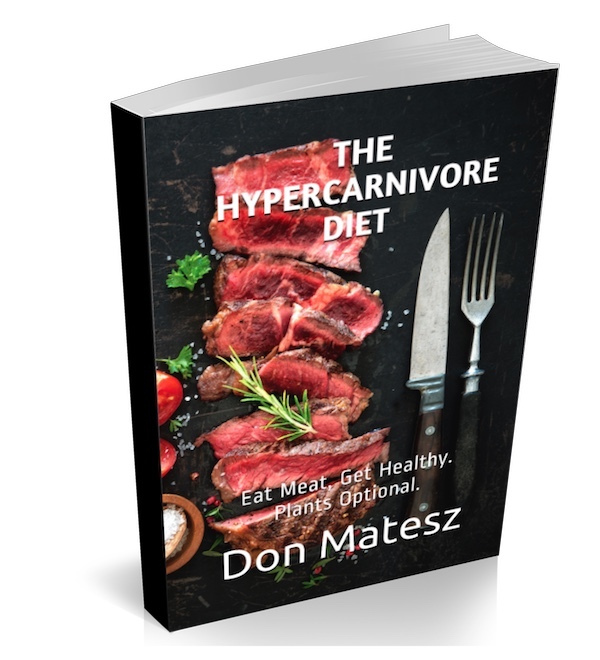 As we say here in Hypercarnivore land ~ Eat Meat, Get Fit, Plants Optional! Can't fathom giving up your greens and veggies? stirred into a blend of cottage cheese & sour cream for a nice post-meal 'dessert' or as a mid-day pick-me-up. Eat what satisfies, provides enduring energy, and helps you realize your health and weight goals. Just don't let yourself go into denial or become complacent. 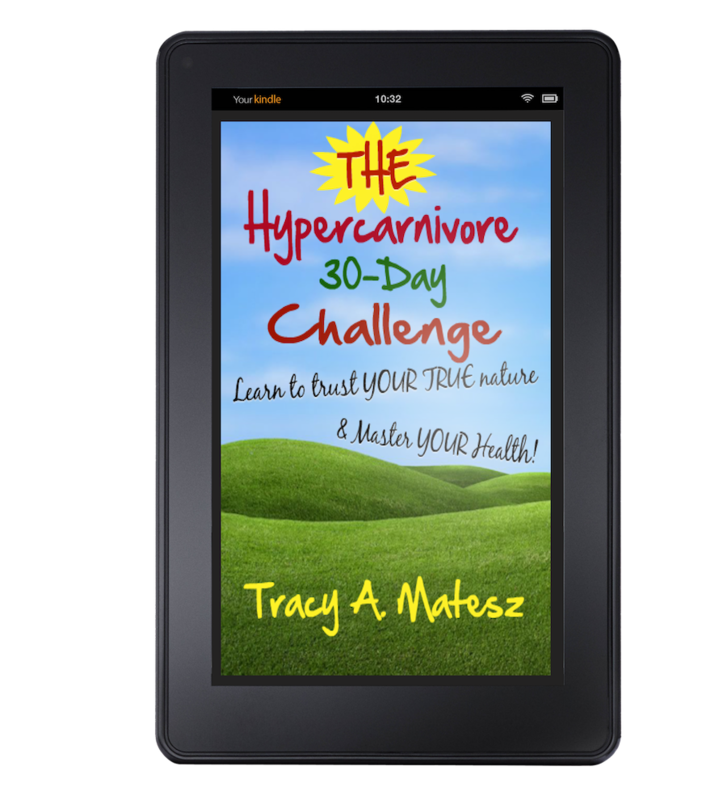 'Eating what you crave' is more applicable once you have had a health re-set, such as after following The 30-Day Hypercarnivore Health Challenge. If you have troubling symptoms that are not resolving, then you have nothing to lose by eating primarily just animal foods for at least one month, then slowly adding back plants to better determine how well you actually are tolerating all those beloved foods. I guarantee you will eventually discover what constitutes a balanced diet for you! Need help? I'm here. I offer health coaching, and a variety of other services.